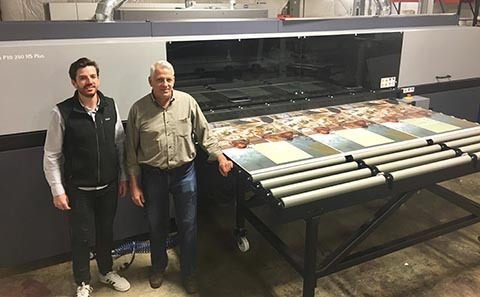 Rochester, N.Y. – Continued growth and commitment to excellence in print production has led Lake Graphics Label & Sign Company to further enhance their digital printing capabilities with the addition of the Durst Rho P10 HS Plus. This comes just a year after adding the two-time award-winning Durst Rhotex 325 in 2017. For Lake Graphics, a leading full-service digital print company based in Cleveland, OH, the two printers give them the advantage of being able to offer the highest quality print in both roll, sheet and soft signage. (Left) Michael Tangry, General Manager, (right) Mark Tangry, Founder/Owner.